The wildfires in Northern California are now the deadliest in the state's modern history with at least 31 confirmed fatalities. Search teams and cadaver dogs began the recovery of victims from "hot zones." Many of the flames still burned out of control in fires that spanned more than 300 square miles, according to The Associated Press (AP). Authorities say containment seemed nowhere in sight. In Sonoma county, about 400 people are unaccounted for while thousands of structures were lost to the flames. Also in Napa county, a fourth day of choking smoke led many residents to flee to find shelters or camped out on beaches to await word on their homes and loved ones, AP reports. CBS News' Carter Evans reports that many people were able to escape and are lucky to be alive. Evans met Charity Ruiz who fled her burning neighborhood by bicycle with her two children hitched to the back -- on top of that: Ruiz is eight and a half months pregnant. "To know that the baby is going to come into this world and of course be loved ... and it will be beautiful, but I won't have a place to bring him home to," Ruiz said. Carol Collins-Swasey, 76, from Santa Rosa, Calif.
Lynne Anderson Powell, 72, from Santa Rosa, Calif.
Arthur Tasman Grant, 95, from Santa Rosa, Calif.
Suiko Grant, 75, from Santa Rosa, Calif.
Valerie Lynn Evans, 75, from Santa Rosa, Calif.
Carmen Caldentey Berriz, 75, from Apple Valley, Calif.
Michael John Dornbach, 57, from Calistoga, Calif.
Veronica Elizabeth McCombs, 67, from Santa Rosa, Calif.
Evans reports that many families will be returning to complete destruction: tiny treasures like photos, memories, movies are all gone. 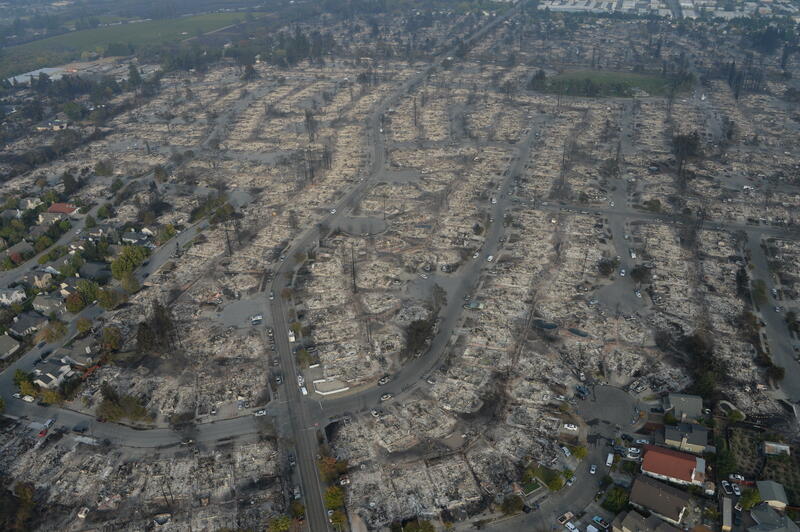 Sonoma County Sheriff Robert Giordano says officials found bodies of fire victims almost completely intact but other remains are "nothing more than ash and bones." According to the AP, fire officials are looking into whether downed power lines or other utility failures could have ignited the fires. AP also writes that some of the state's most historic tourist sites, including Calistoga in Napa Valley, were ghost towns populated only by fire crews trying to stop the advancing infernos. Calistoga, known for wine tastings and hot springs, had dozens of firefighters staged at street corners, AP reports. Mayor Chris Canning warned that the fires were drawing closer and all of the city's 5,000 residents needed to heed an evacuation order. "This is a mandatory evacuation. Your presence in Calistoga is not welcome if you are not a first responder," Canning said during a news briefing. Meanwhile, police are patrolling evacuated areas regularly to prevent looting, CBS Los Angeles reports. Police say in some neighborhoods that are not under evacuation orders, looters are posing as firefighters and telling residents to get out, before going in and stealing items from homes. According to CBS Los Angeles, helicopters and air tankers were assisting thousands of firefighters trying to beat back the flames. Until now, the efforts have focused on "life safety" rather than extinguishing the blazes, partly because the flames were shifting with winds and targeting communities without warning. CBS News' weather producer David Parkinson reports that fire fighting conditions will be improving Friday as winds will back off after Friday morning and during the day Friday winds will be as low as they've been all week.